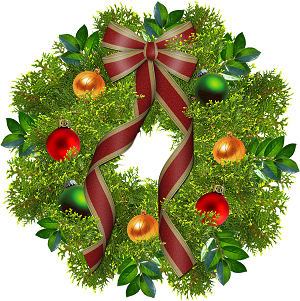 The Milwaukee Region wishes all members a joyful, warm holiday season. Thanks for joining us in 2012 at our events. We look forward to seeing you and your affiliate or family members in 2013. Dec. 8 - Holiday party. Last call. If you get your money and RSVP to Sharon Stewart by Dec. 6 (as in her hands that day), you can still join us for a lovely evening. RSVP and driving directions, schedule and other event details here. Dec. 15 - Meet for coffee. Every month we will meet for coffee and conversation. Show up. No RSVP needed. The December event is at the Panera in Pewaukee. Details here. Jan. 3 - Board meeting. Location to be announced. The board meetings will be held at a new location in 2013. Watch the website for details. Feb. 2 - Carrera Chili. Save the date. This is our annual get together with a friendly competition for the best chili. Start testing your recipes now. Geoff and Stacey Wilde, of Racine, have agreed graciously to host this event for us. More details will be available shortly. The region alternates yearly with Carrera Chili or Turbo Spaghetti, a tradition that goes back several decades. You can attend with or without a chili entry. It's all in good fun. Aug. 16 - Driver education at Road America. Mark this as a vacation day from work in 2013. Get to know your Porsche on the fabled Road America road course. Novices will be paired with an instructor. You will learn to drive within your limits. This is not racing. Watch the region website for additional details including how to register. Aug. 24 - Club day at the Masterpiece on Milwaukee's lakefront. In 2012, 10 region members brought their Porsches to the Masterpiece, a premiere concours d'elegance and car show event on the lakefront in Milwaukee. We hope to have more cars in the Porsche parking area in 2013. You do not need to compete in the concours. Just clean up the car and bring it down for the day. It will be in good company. You will too. Escape - Several region members traveled to Arkansas to participate in PCA's Escape, a shorter version of Parade minus the competitive events. Read the details here and see who attended. Saturday coffee -- We are meeting for coffee once a month on a Saturday. No RSVP required. Just show up and "chew the fat" with other members. Buy your own coffee or beverage and food, if desired. We plan to host this at different restaurants throughout the area including Waukesha, Ozaukee, Milwaukee, Racine and Washington counties to make this convenient for a broad cross section of members. If you know of a restaurant that caters to groups of 10 or more -- and can put tables together so we can sit in a group -- let Donna Daufenbach know. Send her an email <nebioblue99@gmail.com> with your suggestion. She may ask you to make the inquiry of the location manager to determine if the location is willing to accommodate. Read about the first Saturday coffee in November here. The Milwaukee Region welcomes these members who joined PCA or transferred into the region in November. Did winter sneak up on you? Is the Porsche still in the garage as you left it after the last outing and do you plan to not drive it this winter? If so, here are some tips on how to make your car's hibernation a good one. Wheels and tires can make a car look great ... or not. What do you think about the "shoes" on this 964? From the history files.... Reinhold Jöst in Porsche 908/3 Turbo. Anyone know the year and the race track? Check out the classifieds. Members, you can list your sale and wanted items for free. Nonmembers pay a $30 fee for a three-month display. Check out the current classifieds here. Looking for a perfect holiday gift for a PCA member? Need to drop a hint? Visit the PCA webstore for some great items bearing the PCA logo. Shop here. A page full of videos - Porsche at Daytona and more. Check it out here. Sport school driving, Australian style. Check out the gear shift on the left. Video here. Lizards stay with Porsche for 2013 race season. Read the story here. The Cayenne Diesel, the first diesel-powered SUV ever offered by Porsche, made its U.S. debut at the New York International Auto Show in April. Powered by a 3.0-liter V6 turbo diesel engine and delivering 240 hp and 406 lb. 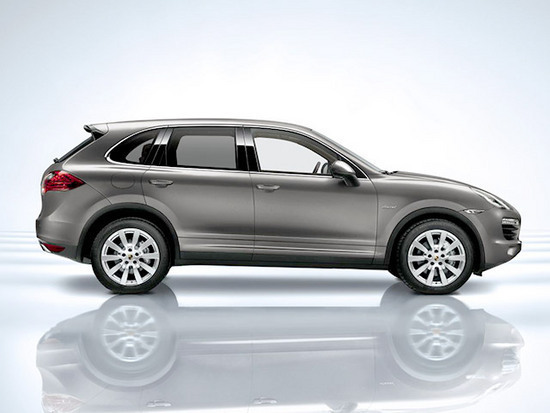 ft. of torque, the Cayenne Diesel can travel up to an estimated 740 miles on a single tank of fuel. During its first month on sale, the Cayenne Diesel accounted for nearly 20 percent of all Cayenne sales in the U.S. The model was first introduced to the European market in 2009 and arrived at U.S. dealers in September 2012. The 25th annual "Best of What's New" awards are currently featured on the Popular Science website, www.popsci.com, and include categories such as auto, green, health and gadgets. The world’s first black timepiece, the legendary exclusive eyeglasses and the Porsche 911 – for decades, each of these products has stood as a unique design by Ferdinand Alexander Porsche. In 1972, he founded the Porsche Design Studio in Stuttgart, which was relocated to Zell am See in Austria in 1974. The Porsche Museum is marking the company’s 40th anniversary with a special exhibition. From Nov. 13 through Feb. 17, 2013, museum visitors can experience the most important, interesting and extraordinary Porsche Design products and learn how Porsche Design came to exist. The focus of the anniversary exhibition is on the “Porsche Design” brand, which in recent years has been developed into one of the world’s leading luxury brands with its own sales network. F.A. Porsche designed a number of classic men’s accessories such as watches, eyeglasses and writing tools, which achieved worldwide recognition under the Porsche Design brand. With his team, he also designed a plethora of industrial products, household appliances and consumer durables for internationally-renowned clients under the “Design by F.A. Porsche” brand. F. A. Porsche won numerous honors and awards for his work as a designer. “Chronograph I,” the world’s first black timepiece and Porsche Design’s first product, is compulsory to the exhibit. The watch created a furor in 1972 because the automatic chronograph – unthinkable at the time – was designed in matte black throughout and was provocatively unadorned. With this watch, F.A. Porsche anticipated a trend that still remains in today’s watch industry. Other products from the accessories and eyeglasses range will also be on display, such as the Porsche Design P’8478 exclusive spectacles – purchased by more than 7 million customers. Writing implements and pipes will also be featured in the exhibition. Another highlight of the special exhibition is the grand piano, which the Porsche Design Studio created for the Bösendorfer piano factory in 2003. This grand piano symbolizes the studio’s design output, characterized by a clear, functional design language, meticulous choice of materials and top quality workmanship. The adjustable “Antropovarius” lounge chair developed by the Porsche Design Studio in 1982 will also be featured, as will the “Alternative Motorcycle Concept” designed in 1980 as an alternative solution to the car and to conventional motorcycles. The exhibit will also honor the life of F.A. Porsche, who created legendary cars such as the 904 Carrera GTS and Porsche 911. In time for the anniversary, Porsche Design 40Y: The Book will be published and made available in the Porsche Museum shop and other bookstores. More information is about the Porsche Museum is available at www.porsche.com/museum. Porsche China and Shanghai International Circuit Co., Ltd. held a foundation ceremony to celebrate start for the development of the Porsche Experience Center in Shanghai. To be established adjacent to the current Formula One track at the Shanghai International Circuit (SIC), it will become the first Porsche Experience Center in China and in all of Asia, joining an exclusive group of other Porsche Experience Centers in Leipzig, Germany and Silverstone, England. The innovative facility will offer Porsche customers and enthusiasts from across the country the opportunity to discover the pleasure of driving and to hone their skills on the track by experiencing the full range of premium Porsche cars. With construction scheduled to be completed by late next year, Porsche plans to open the Experience Center by early 2014. The facility will be directly managed and operated by Porsche China, and it will represent a total investment by the marque of more than 135 million RMB. Created to make it easier than ever before for enthusiasts to immerse themselves in the world of Porsche, the completed Porsche Experience Center will be a 100,000 square-meter driving facility including a handling circuit, slalom module and low-friction circle — and a three-story Training Center. Through both, guests will optimize their driving knowledge and technique. Each and every one of them will have the chance to experience the superior performance and capabilities of all Porsche cars as they learn to achieve the full force of Porsche. It has long been a goal of Porsche to allow all Porsche customers and enthusiasts in China to enjoy such regular and convenient opportunities to steer the full range of Porsche cars. Therefore, after initially beginning preparatory work towards that end more than one year ago, Porsche has since been steadily moving forward with plans to found this new destination for Porsche customers and enthusiasts. This February, the marque signed an agreement with Shanghai International Circuit Co, Ltd to locate the Porsche Experience Center beside the SIC, putting it in the company of one of the most renowned destinations for motorsport in China where the F1 Chinese Grand Prix is held every year. 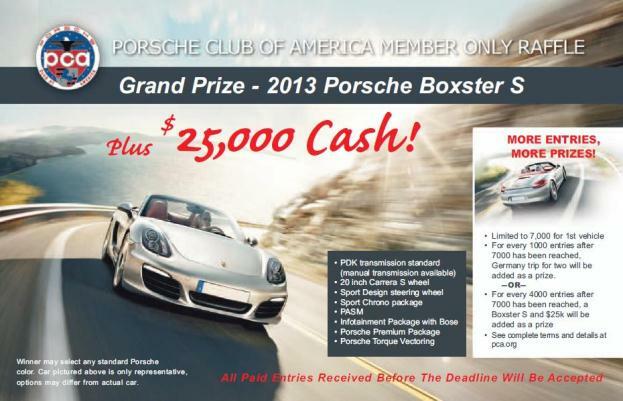 Don't miss PCA's raffle. Details here. Deadline is Dec. 10. Blast from the past - Watch this video from the 1958 June Sprints at Road America. This newsletter is mailed to all Milwaukee Region members. If you did not receive the email, check your PCA membership data online at www.pca.org. Click on the member log in tab and follow the instructions on how to set up a log in and password for the national site. Then check your membership data to make sure everything is current including your email address. The region uses email and the website as its primary communication channels. If you don't have an email on record you are missing all of our notifications and reminders.